After you are done with the upload of your files, you have the possibility to adjust the speed of your slider. Adjust seconds per image and motion speed. You can do this where the red arrow points to and you can choose any value in seconds. Seconds per image: This is the time each picture has, including the time for the motion. Subsequently this means that the value for the motion speed can't be higher than this value. Motion speed: This is the time in seconds for the slide effect for each picture. As already said this value can't logically be higher than the value for “Seconds per image”. 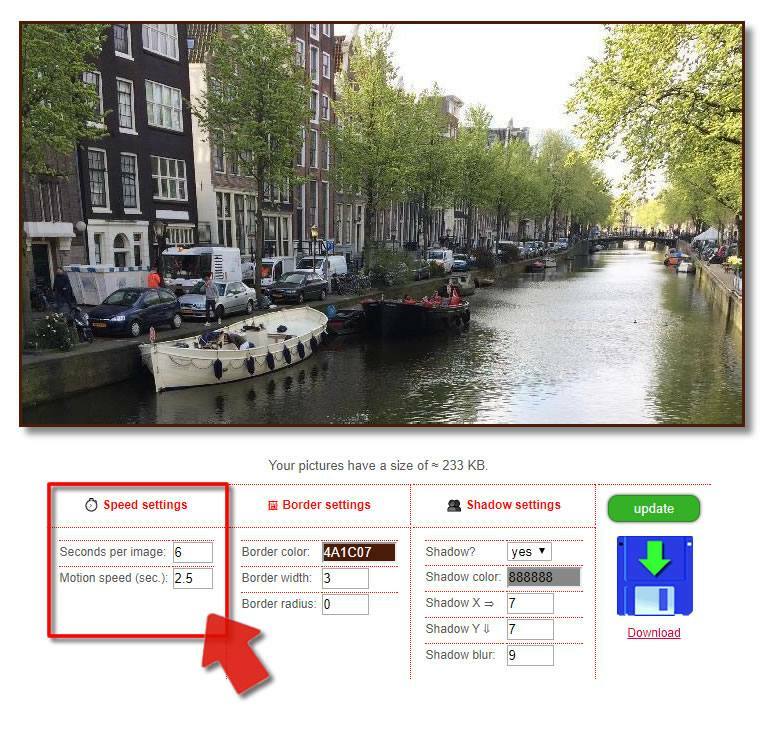 If you choose a higher value anyway, this value will be set to the same value as “seconds per image” automatically. Update button After you made your settings press the green “update” button. This will calculate the slider again and show you the results. Afterward you can download the slider if the result meets your expectation. In case not, try some other settings.